Only Fools and Horses has become one of the nation’s best-loved comedies and although you may claim yourself to be a super-fan, you may not be aware of the sort of things that went on whilst the cast were off camera. The classic sitcom ran for seven series and had 15 special episodes over the course of twenty years. Can you imagine throughout that time the amount of hilarity that occurred whilst the cast were filming all those episodes? Well you’re about to find out some of the capers they got up to! Through several years worth of interviews and extracts from autobiographies, we have collated some incredible stories that will certainly amuse, shock and amaze you. Here are top 8 of the most bizarre and hilarious occurrences that happened behind the scenes of the iconic television comedy series..Oh and we’ve saved the best ones for last. 8. The cast pestered Buster Merryfield about his real name and to shave his beard! Buster Merryfield played the role of Uncle Albert from 1985; who replaced the senior citizen figure of Grandad when Lennard Pearce unexpectedly passed away. Over a number of years, the cast would pester Merryfield to admit his real name – which he later revealed to be Harry. Despite this, he would never answer to his birth name; only Buster. Although he admitted his true identity to his cast members, he concealed the secret of his birth name until the day he died, but this was later to be revealed in the press after his passing. Merryfield was in fact given the nickname by his grandfather the moment he was born; due to weighing a hefty nine pounds – and it just seemed to stick. The cast also wished to see what Buster looked like without his trademark beard – but he never gave into that one! Despite being a huge BBC show, many of the rehearsals for Only Fools were held at a local church in Hammersmith, London and it was only dress rehearsals and the final performance that were studio-based. Before the filming session which was performed in front of a live audience, Jason and Lyndhurst would eat the same meal every single time, as a result of nervousness and superstition, so as not to mess up their usual routine. Jason would have sausage, chips and beans, and Lyndhurst would go for egg, chips and beans. During his early days on the show, Buster Merryfield suffered from severe anxiety during filming sessions as he had no television experience whatsoever. It was at the older age of 59, in which he retired from his day job at Natwest Bank and decided to pursue acting professionally. Despite being in amateur productions throughout his young adult life, he never made his big break until 1985 on Only Fools. During the filming of his first few episodes, he would frequently fluff his lines, not give enough time to deliver a punch line, or would suddenly lose his train of thought when delivering lines. Lyndhurst and Jason gave him a good talking to, with the fear that if he didn’t pull himself together, he’d either walk away from the acting industry or get the boot. They gave the advice that if he were ever to make a mistake; just to throw the blame onto someone else or make it part of the joke. Over time, Merryfield relaxed into the role and created the iconic Uncle Albert that has now become a legendary TV character. Merryfield did of course sadly pass away at the age of 79 in 1999 from a brain tumour, but we all agree he did great in his lifetime and we love him! 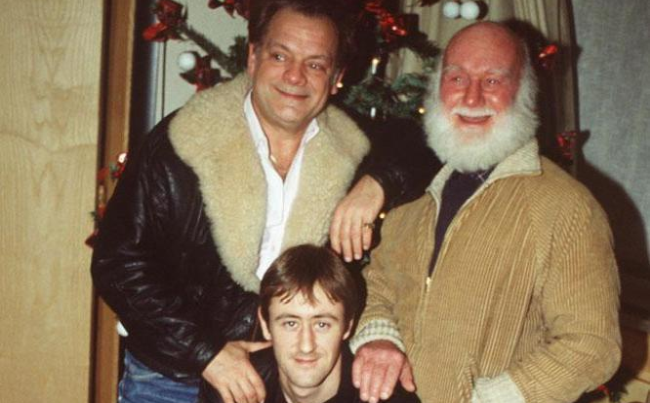 In 1986, the cast of Only Fools and Horses were delighted to be given a slot at the Royal Variety Performance. It was presumed they would just perform a well-known scene from the sitcom, but fans were delighted to learn that they would actually be taking part in a brand-new one-off sketch. At the end of the performance, Del accidentally mistakes the Queen Mother for his employer; who was actually a spectator of the show in the theatre. Quite hilariously, Del waves to her – and much to David Jason’s disbelief, she waved back! After the performance, Jason was said to have been quite emotional when meeting the Queen Mother in the flesh – she thanked him and he told her that he was deeply touched that she enjoyed the sketch. The entire cast had been filming ‘A Royal Flush’ at the time, so after the show took place, they drove back down to Dorset and celebrated with a bottle of whiskey. While Del Boy Trotter was a professional fly-pitcher, it seemed David Jason knew much more about playing the role than one may have expected, due to his own personal experiences growing up. He would frequently watch the act of illegal trading of stocks during his childhood days in London, which allowed him to ad-lib during most of these scenes. Jason had a very normal upbringing. His father was a porter at Billingsgate Fish Market and his mother; a charwoman. Before making it in the acting industry, Jason worked as an electrician for six years before deciding to take a leap of faith and follow his dream of making it in the entertainment industry. Little did he know as a young adult, that those early experiences would set him up to play one of his greatest roles. Anyway, just to add to the banter, Jason, Lyndhurst and Merryfield thought it would be hilarious to send a Trotters van to Kuwait via a Hercules plane during a supply run. They filled the van to capacity with all sorts of bits and bobs- chewing gum and cake; amongst many other random objects to cause a laugh. You’ve probably never heard of this story, as Jason was concerned the public would get the wrong end of the stick and come to the conclusion it was solely for publicity purposes, therefore the media never got hold of it. He later claimed that the whole intention of the gaffe was to have a bit of banter with the RAF lads. It seemed Jason and Lyndhurst couldn’t help themselves when it came to teasing Lennard Pearce who played the role of Grandad between 1981-1984. On one particular occasion, the pair went a little too far with a stunt…and Lennard wasn’t too chuffed. Talking to the Daily Mail in 2013, Jason said: “When filming began, Nicholas and I bonded quickly, despite our 21-year age difference. We shared a love of mucking about, although we sometimes went too far. Lennard Pearce normally saw the funny side of things but once, when we broke into the wardrobe room, turned his costume inside out and nailed his shoes to the floor, he refused to work until we apologised effusively. One of Lyndhurst’s favourite memories was during a filming session on a rainy day in London, in which a young school girl who happened to stumble across a filming session made a hilarious dig at the cast members without even realising. “We were in London’s Chapel Street Market. It was early morning. The sky was black and the rain coming down in buckets. The cast and crew were sheltering under huge umbrellas. We were cold and bored. Into this rather bleak scenario, a schoolgirl aged about seven or eight came running, soaked to the skin and looking for shelter. There was a huge clap of thunder and she dived under the brolly I had been given. I watched her as she caught her breath, her puzzled face trying to make sense of what she could see – a large group of grown men and women trying to shelter from awful weather in otherwise a deserted street. “What you doing Mister?” she said. “We’re making a TV programme! I replied. Absolute comedy gold. That story never fails to make me laugh. What are your favourite stories about Only Fools? Have we missed any good ones out? Let us know! If you've completed just 3/10 of these hardest PlayStation 2 games..you're a PS2 legend!